So began the subject line in a recent email from a dear friend. In its entirety it read, “To Lora V…the girl who never lets the snow stop her.” Attached to the email was this fabulous surprise: the above portrait, illustrated by the incredibly talented (and dare I say beautiful) Sam Smith, who’s recently launched Sam Smith Creative. Sam’s cheered me on through every marathon training cycle I’ve done. Wholeheartedly, enthusiastically, unwaveringly. 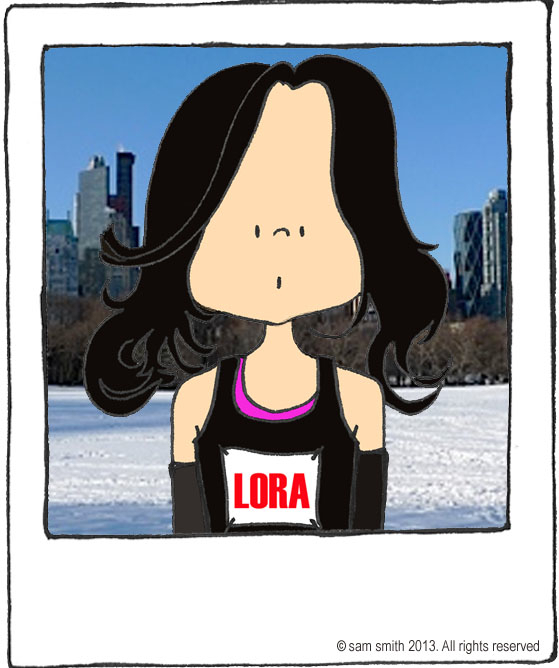 When I saw the way she chose to depict me – in running gear, race bib meticulously pinned (better than I can manage in real life), amongst a bed of snow in Central Park – I just smiled big. This woman knows me well: the runner who won’t be deterred by elements or obstacles. To Sam, I say thank you for the gift – that of your heartfelt friendship and immense support. And, for the lovely portrait. I adore it! Runners, we are indeed a fortunate community with the richest of gifts: each other and those who support our efforts to reach further, push harder, and unearth our potential with every mile. Thanks! She is an amazing illustrator! LOVE this! What a thoughtful gift!